Hiplife musician, Wisa Gried, is finally free from his court case which had been dragging on for almost three years now. On April 30, 2018, Wisa was convicted, and charged for gross indecency for showing his manhood on. This was during one of his performances on stage during a music show in 2015 . He was consequently fined GHC8,400 or spend 24 months in jail in default. The ‘EKIKIMI’ hitmaker was consequently ‘slapped’ with a two-year jail term or pay a fine of GHC8,400. The musician, with the help of a few colleagues of his chose the latter, hence his freedom. However, as the saying goes, from grass to grace, Wisa has moved from court to the Jubilee House. 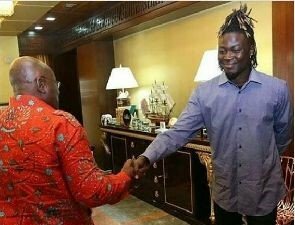 The musician after being set free in from court on Monday has met President Akufo Addo. This was at the Jubilee House on Thursday, May 3, 2018. Wisa, took to his official Instagram page to share the news with his fans. He shared a photo of himself exchanging pleasantries in the form of a hand shake with the president. The visit, we understand was to pay a courtesy call on the President. And to also inform him of the official launch of his label office coming off sometime this month. Comments following this photo on social media shows that fans are excited to see that Wisa is towing the right path after his trial. Some of his fans are also advising him to be of good behaviour to avoid such court trial the next time.